This is the first in a four-part series, posting weekly on Thursdays, to introduce concepts of Aqua Yoga. I love the water– I love the feeling of floating and being free and light. Being in the water allows me to both escape my body and come in very fine balance with it at the same time. For that reason, aqua yoga provides me a way to play with buoyancy and balance in a way that a land-based mat yoga class does not. Let’s dive right in and think about it. 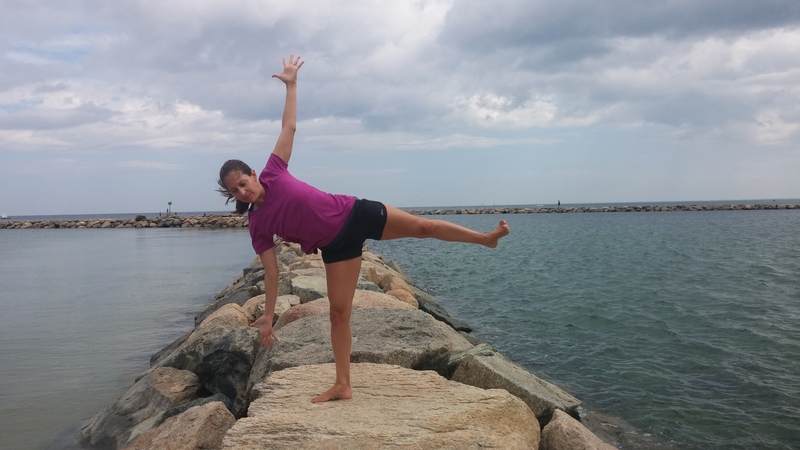 When on land, balancing postures are some of the most physically challenging parts of yoga. We must feel confident that we aren’t going to fall. Scary! I am so worried about falling that I can’t keep my hips stacked or raise my leg to full extension. We must trust that we have the strength in our legs to hold our weight. If we’re really good, we even try to concentrate of getting the alignment of the body correct so we can breathe deeply and experience the full expression of the asana. But let’s be honest– most of us are working so hard just to hold the pose in whatever way we can that we are cutting short the experience we’re trying to achieve. This Dancer looks pretty graceful, but I cannot hold this alignment for very long…and I’m certainly concentrating more on the physical work of the pose than the breath moving through me. The water helps to alleviate much of the risk of balancing postures. First of all, who cares if you fall? Rather than risking an injury, you just get wet. With a little support from a noodle, I can feel confident in this more complete expression of Half Moon. Next, the water carries about 75% of your bodyweight when you are standing in chest-deep water. That means less weight on your joints, and that can help you focus on the correct alignment of each body part. It also translates into the ability to hold postures for much longer than on land. All of this together means that you can hold a well-aligned pose long enough that you can breathe deeply and enjoy the full expression of the posture. Without all of the gripping in the muscles due to lack of confidence and/or physical stamina, the ease of breath while in water flows freely. Experimenting with balancing postures in the water is available to a wide population, especially to those people who lack confidence to try them on land. 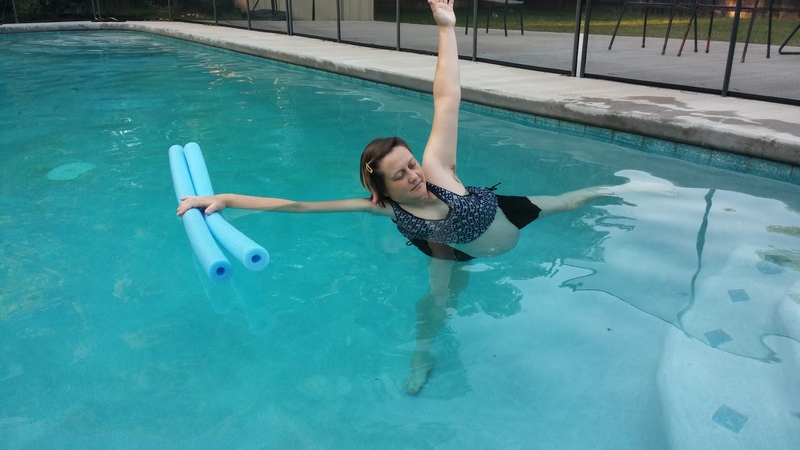 Whether you are obese or pregnant, practicing aqua yoga balancing postures is fantastic for their strength-building potential. An aqua yogi at eIght-months pregnant, able to find Full Moon with the support of the water. Now, don’t go thinking this means that balancing postures in the pool easy. Because you are buoyant and gravity isn’t doing it’s thing to keep you on the floor of the pool, you are forced to concentrate on the rooting down in the base leg of the posture. By bringing your focus to your foot, you can begin to think of how the posture is stabilized, then trace the alignment of the body up from that base. Again, because you are not working so hard just. to.get.in.the.pose. you can turn your attention to alignment and breath. This deeper level of inner focus that can be achieved in the pool will translate to a mat practice, too. Three first-time aqua yogis playing with breath, buoyancy and balance in Graceful Dancer. Grab some noodles and get in to the pool. 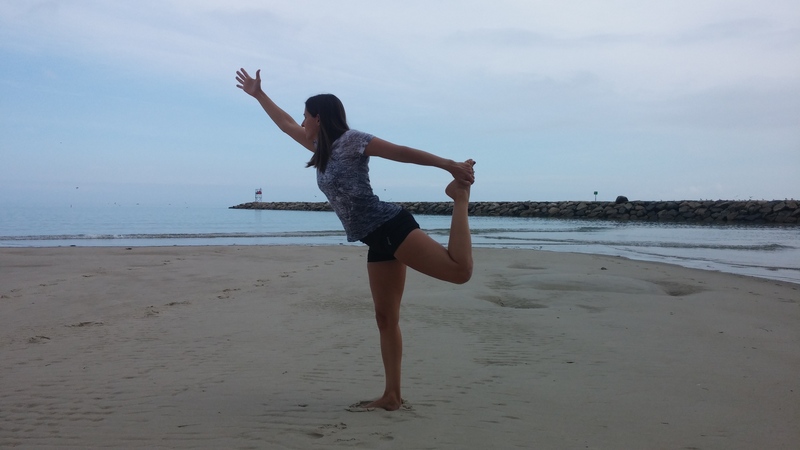 Aqua Yoga can help you find your balance, both mentally and physically. Good health and great happiness to you! I teach Aqua Kriya Yoga classes and host private events in Austin. Here’s a complete list of certified Aqua Kriya Yoga teachers. This entry was posted in entrepreneur, fitness, healthy living and tagged aqua yoga, balance, coaching, personal training, prenatal fitness, women's fitness. Bookmark the permalink.